Reference number for this case: 5-Oct-54-Derval. Thank you for including this reference number in any correspondence with me regarding this case. The result of the investigation by the police of Derval who collected the statements of two persons who, on October 5, late afternoon, would have seen, Derval, a mysterious machine, are now known. It was a farmer who came back from the field, and a child who came home from school. The first claims to have seen, some three hundred meters high, a cigar-shaped craft, first moving vertically, then coming down, then disappearing behind a clump of pine trees. The kid, meanwhile, reportedly saw this thing at about the same jour, around 6 p.m., just from the other side of the pine woods, but this time on the ground, on a meadow. Frightened, he ran away. The statements of the two witnesses are quite consistent, declaring, for the first, that the object was of a gray color, and the for second, gray but dotted with yellow and orange hues. Neither one nor the other saw a human being. Ufologist and author Jean Sider learned by an article from the newspaper Ouest-France, of Rennes, on page 9 for October 14, 1954, that on October 5, at approximately 06:00 p.m. in Derval in the department of the Loire-Atlantique, the gendarmerie officers of this community noted the statements of two people who, on October 5, 1954 at the end of the afternoon, had seen a mysterious machine. The first witness was a farmer who stated that while returning from the fields, he saw at some three hundred meters of altitude, an apparatus in the shape of cigar which initially moved vertically, then back and forth, and then disappeared behind a group of fir trees. The second witness is a small boy who said to have seen this machine at the same time of 06:00 p.m., precisely on the other side of the group of fir trees, but this time on the ground on the meadow. Afraid, he fled. The two witnesses have both described the machine as of gray color, the small boy having also seen yellow and orange areas. Neither one nor the other saw human beings. Luc Chastan indicates that in the Loire Atlantique in Derval on October 5, 1954 at 18:00 hours a first witness observed at three hundred meters height an apparatus in the shape of a cigar moving initially vertically, then to and fro before disappearing behind a group of fir trees. A second witness (a child) saw from the other side of the thicket of fir tree and at the same hour an object on the ground, he is frightened and flees. The object is described by the two witnesses as being of gray color, the second specified that it areas of yellow and orange. Luc Chastan indicates that the source is "Lumières dans la Nuit". Place Approximate coordinates Date 1954 Civilan hour Duration Sky Distance and movvment of the ufo Altitude of the ufo B angle of the sun on the horizon Azimut of the sun B angle of the moon on the horizon Azimut of the moon EL State of the night Case Comment LDLN ref. The website indicates that on 5 October 1954 at 18:00 in Derval, Pays-de-la-Loire, France, there was a UFO sighting. 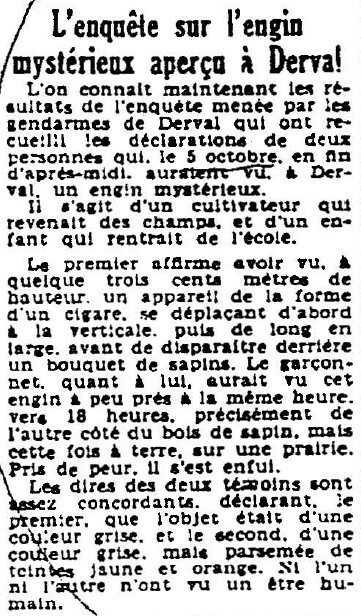 [of1] Article in the regional newspaper Ouest-France, Rennes, France, page 9, October 14, 1954. [js1] Article by Jean Sider in the ufology magazine Lumières Dans la Nuit (LDLN), France, #319, August 1993. [js1] "Le Dossier 1954 et l'Imposture Rationaliste", book by Jean Sider, Ramuel publisher, France, page 97, 1997. 0.1 Patrick Gross November 5, 2005 First published. 1.0 Patrick Gross January 5, 2009 Conversion from HTML to XHTML Strict. First formal version. Additions [lc1], [ud1]. 1.1 Patrick Gross September 23, 2014 Additions [of1], [ed1].